Flip Breskin is internationally famous as a co-founder of PSGW. A major player in the Northwest folk scene since the 1970s, Flip is an inveterate song catcher. 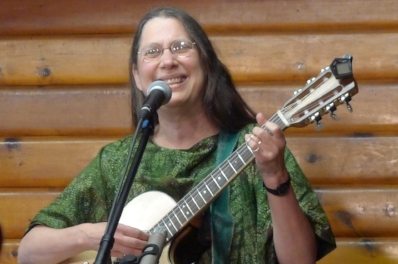 She plays old and new folk songs with great sing-along choruses, songs of compassion, outrageous songs, and sweet solo fingerstyle guitar. Peter Berryman says of Flip, "I'd listen to Flip sing the phone book." And Bob Franke adds, "I never met a songwriter more grounded in musical and moral values than Flip. She cares more about telling the truth than most people you're likely to hear and she does it well: At the same time she's a lot of fun to listen to."